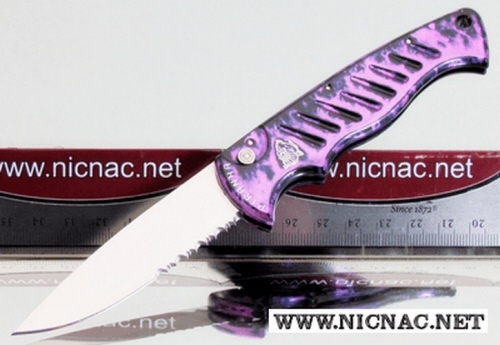 Piranha P-1 Pocket Automatic Side Opening Knife is the perfect pocket carry automatic knife! The Piranha Knives Pocket P-1 automatic knife is overall open length 7.5 inches with a blade length of 3.23 inches closed this stylish knife is 4.175 inches and features recessed grooves for an extra grip. The handle is made of 6061-T6 Aluminum with a 154-CM, 60-61 RC blade that is .09 inches thick. The P-1 Pocket comes with a titanium pocket clip for comfortable every day carry and is Made in the USA!